Your WDW Store is the best place to shop for products showcasing the wonderful, magical world of Disney! We work hard to provide products that are often hard to find, such as limited edition lines and special collections. Whether you're trying to fill out your own personal collection or you're looking for a gift, we have what you need in our online store. Your home and office aren't the only places you can show off your love for Disney! Why not decorate your vehicle too? Our Disney auto clings and decals are perfect for adding a touch of magic to your transportation. 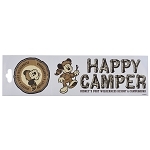 Browse through our selection of Disney car decals and Disney car clings and order yours today!